Please see the outline for Homework for Week 10! Sports Carnival - Your child can wear their Sports Uniform with Faction T-Shirts Tuesday to Thursday this week. If you wish to take your child home from the carnival on Thursday, please make sure that you have given me the note. Footy Colours Day - This Friday in addition to being Mission Markets, students are able to come dressed in the colours of their favourite footy team. Learning Journeys - Thank you to those parents that have already put their names down. If you are unable to make the given time today, please feel free to come in an morning or afternoon. This is a session that is run by your child. If you can let me know when to expect you I would be most appreciative. Mackillop Uniform Fittings - Please see the note in the newsletter about the fitting afternoons this week. They will be run on Wednesday 23/9 and Thursday 24/9 from 2.30 - 3.30pm. 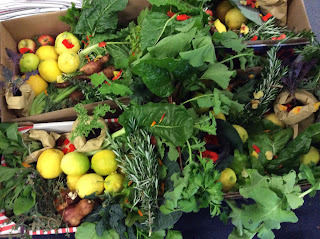 On Tuesday, the Year 6’s harvested 5 more hampers of fresh produce from the school’s food garden. This finalizes the Growing Food for the Community Program for 2015 with 15 hampers being distributed to those in need in the local community. The first part of the program began in Term 2 where students were taught key\ concepts of organic gardening. These concepts included the types of vegetables grown as ‘cool season’ crops, how to attract beneficial insects to the garden, the importance of biodiversity, integrated pest management and soil structure & health. The second part of the program enabled the students to harvest their vegetables and prepare hampers. These hampers were then donated to Saint Vincent de Paul for distribution to those in need, in our local community. On Friday 25th September, we will be holding our Annual Mission Markets beginning at 11.45am. The Year 6 stall item this year is Popsicle Pick! Can we please ask that all Year 6 families provide 2 packets of Freddo Frogs (or something similar) to be given as prizes? If you can please have these in by Friday 18th September I would be most appreciative! I will purchase 5 major prizes to be used on the day. Here is a copy of the note that will go home today in regards to Learning Journeys next Monday. On Monday 21st September, Silver Room will be having our class Learning Journey. These will begin at 3.15pm. Please see the schedule that has been placed in our wet area outside of the class to write your name in. The idea of the Learning Journey is that you come in to the class during your chosen time and your child will individually share their class work with you. The sharing is designed to take about 20-30 minutes and will be directed by your child following a given outline. If you are unable to make any of the times above, please contact me to arrange an alternative time. We will be completing another harvest tomorrow morning at 9am to make up hampers of fresh fruit and veggies to those in our community that need additional support. If you are able to come in and help us harvest and box up the veggies we would love to have you! Also, if you have any surplus produce in your own veggie patch that you would be happy to donate we would love to take it off your hands to bulk up our hampers! Please see the email below from Jo Edmonds who undertook our Mindfulness learning this term. I feel privileged to have been welcomed into the year 6 class to share mindfulness. We have taken a journey to explore how to build healthier, happier brains through considering and understanding emotion, compassion, mindfulness and meditation. We presented the students a simplistic understanding of how the brain is wired and in turn, how our emotions, when negative, can affect and cloud our thinking. One tool for mindfulness we practiced was belly breathing as a way to calm down. Please see below for the Homework that has been assigned for this week. Have a fantastic week and I hope to see you all at the big game on Friday night...bounce down is at 6.30! Reading – 10-15 minutes. Write in their diary and have it signed. Maths – Times Tables App – 5 minutes max. This score is to be written into their diary. BTN – Popplet on your story of choice. Books Light Up Our World! Last Wednesday Book Week festivities took over OLC. The children were dressed to impress as their favourite character! We enjoyed a fantastic morning having our parade and hearing from the teachers to see who they had come dressed as and we were also lucky enough to receive a special message from David Wirrapanda thanking us for our efforts and donations to improved Indigenous Literacy. During the Great Book Swap, we raised over $650 to support the Indigenous Literacy Foundation! Thank you all of our amazing parents for your efforts to get us looking our best! Please see below for the homework for this week. I have also set some tasks on Mathletics for the students to try to review our current work. Complete the given activities. You need to be doing at least one activity per night. I am only able to set 10 activities per person and I am not able to do this until you have completed all assigned tasks. BTN - Popplet Activity to be completed on the story of your choice -Due Thursday 10th September.